This summer, SBMA Youth Clay Students (7-12 years old) created a unique garden totem which has been installed in the museum garden bed at the north end of the campus along St. Joseph Street. This project was directed by Kathy Fodness, long-time SBMA ceramic student turned instructor. During SBMA’s Youth Clay classes, each group of students carved their own ceramic cylinder as part of a whole totem, culminating in four totems for the garden. Kathy encouraged interaction and class discussion by allowing each group to choose their own theme for the totem. 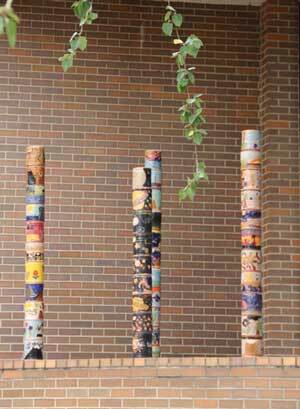 Each cylinder is a unique expression of the students’ ability with clay, and each totem its own piece of art, following a theme of Nature, Aquatic, Outer Space, or Seasons.As a set, the four diverse totems are viewable from both inside the Carmichael Gallery as well as outside on St. Joseph Street.